Lonnie C. King, click here. 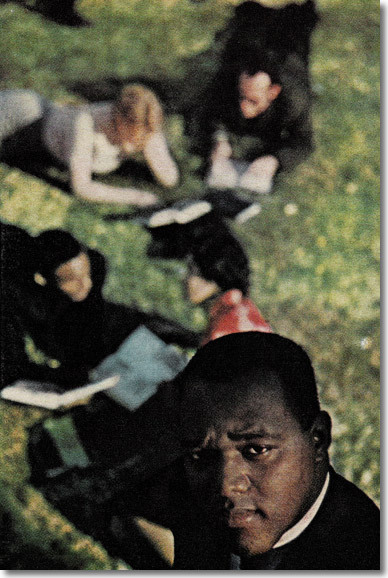 Lonnie C. King "The Second Battle for Atlanta"
Cal Bernstein photographed Lonnie C. King in 1961 on "the Quad" at Morehouse College where he organized thousands of students to sit-in at lunch counters downtown. LOOK wrote, "At 24, this former Morehouse College fullback is sharply aware of his own inadequacies; but he often seems 'arrogant' to white Atlantans because he approaches them as an equal rather than as an inferior." Even in 1960, when most of America was still dozing, there were rumblings that would wake up a generation  particularly in the civil rights arena. Lonnie C. King was a 23 year old Morehouse College student in Atlanta in 1960. He was also a Navy veteran, a boxer, starting fullback on the football team and a natural leader. He heard about four young African Americans who had the audacity to sit in at a Woolworth's department store lunch counter, simply asking to be served. "They lit a flame that engulfs me to this day," King says. He went to his friend Julian Bond and said, "Let's follow Greensboro. After some cajoling, we all went out and starting organizing." What they organized was characterized by LOOK Magazine in April 1961 as "The Second Battle of Atlanta." King and his friends organized sit-ins and boycotts to demand integration of the stores, lunch counters, movie theaters and courthouses of Atlanta. The attack is directed against forces of evil rather than against the persons who happen to be doing the evil. It is based on the conviction that the universe is on the side of justice. At its center stands the principle of love." in the back of the bus." 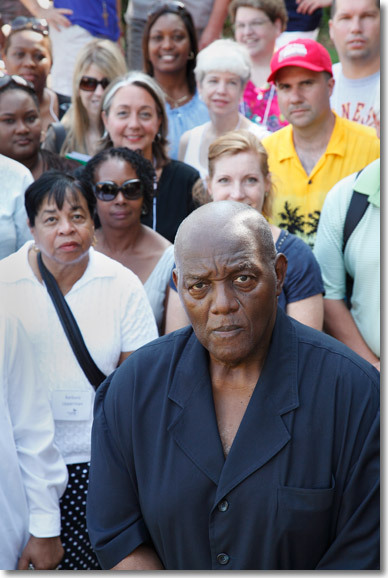 Lonnie C. King talking with a group of teachers from all over the nation touring sites of the 60s civil rights struggle. July 2010. Today, Lonnie is proud to be known as a civil rights pioneer, and he's still active in the movement. At 73 (in 2010), he's getting his doctorate in history so that may inspire young people. "If I can get my PhD at my age with high honors," he says, "I can tell a Kindergarten kid or a fifth-grader, 'You can do it! I was born looking up at the bottom, and if I can do it, you can do it.'" "And my mother said, 'No, I don't.'" So, it's difficult for you 50 years later to understand the oppressiveness that went on." Both in an extensive oral history interview and in documentary video of Lonnie talking with teachers today, the emotions of those events half a century ago still resonate. Those events changed everyday people and still impact our lives today.